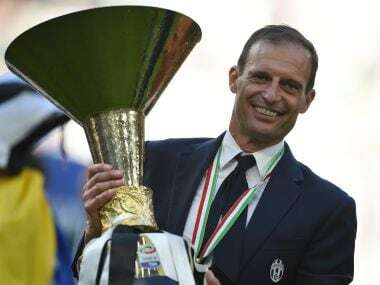 Turin: Juventus coach Massimiliano Allegri called on the Turin giants to complete a historic treble in the Champions League final after securing a third successive league and Cup double on Sunday. "This season was much different to last season. Now, we have the dream of the Champions League final, which you don't get to play every year," Allegri said after a 3-0 win over Crotone wrapped up a sixth straight Serie A title. "It's our second final in three years, so we have to congratulate everyone at the club. I'm happy to coach here, and we'll soon sit down to talk about some ideas. "But right now, the most important thing is to play, and win, the final in Cardiff (against Real Madrid)." First-half goals from Mario Mandzukic and Paulo Dybala, and a late header from Alex Sandro sealed a comfortable victory to leave Juve four points clear of Roma with one game to play. Mandzukic gave the hosts a 12th-minute lead when he met Juan Cuadrado's cross at the back post to fire past Crotone goalkeeper Alex Cordaz. Croatia international Mandzukic, celebrating his 31st birthday, almost gave Juve a 2-0 lead before Fabio Sampirisi toe-poked the ball away from the big forward as he teed up. But the fans who packed out Juve's stadium for their final home game of the campaign were not to be denied. 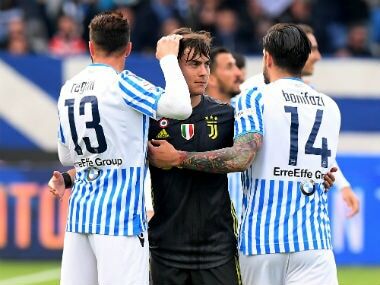 Dybala doubled the lead with a sumptuous free-kick that curled into the top corner to leave Cordaz with no chance six minutes before half-time. Looking for a win to boost their top-flight survival hopes, Crotone came close to reducing the arrears on the stroke of half-time when Diego Falcinelli's effort deflected off Mehdi Benatia and skimmed the roof of the net with Gianluigi Buffon stranded. But the Calabrians were never likely to deny Juventus the well-deserved title celebrations that were put on hold last week when Roma stunned Allegri's men 3-1 at the Stadio Olimpico. Juve bounced back from their defeat in the capital three days later with a 2-0 Italian Cup final victory over Lazio. And their third consecutive league and Cup double, also a record, was all but sealed seven minutes from time when Sandro's bullet header pinged in off the underside of the crossbar, goal-line technology confirming it had crossed the line despite the best efforts of Cordaz. 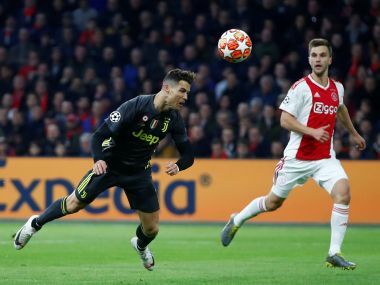 With two legs of the treble complete, Juventus will try to dethrone 11-time European kings Real Madrid in the Champions League final in Cardiff on June 3 to accomplish what no team in the club's history has ever achieved. Inter Milan finally awoke from a recent league slumber to claim their first win in nine games, although their 3-1 win over 10-man Lazio was too little too late as they lost out on the chance of qualifying for the Europa League. Inter's last win was a 7-1 rout of Atalanta in mid-March, the Nerazzurri going on to lose six in an eight-match winless streak that saw coach Stefano Pioli sacked two weeks ago. A team led by caretaker coach Stefano Vecchi finally turned on the style, after Keita Balde's 19th minute penalty for the hosts after a foul on Felipe Anderson to take a 2-1 lead at the break thanks to goals from Marco Andreolli and a Wesley Hoedt own goal. Eder, playing in place of injured captain Mauro Icardi, fired Inter's third on 74 minutes but the visitors spurned several chances to add to their tally when both Keita, on 66 minutes, and Senad Lulic, on 78 minutes, saw red for second bookable offences. Inter moved up one place to seventh, but are four points behind city rivals AC Milan, in the final Europa League spot, with one game remaining.